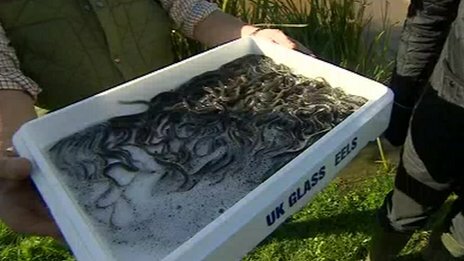 About 20,000 eels have been released into a Shropshire river as part of a project to boost numbers. The eels were taken out of the River Severn near Tewkesbury, Gloucestershire, in June, and released into the Teme at Ludlow. An estimated 100 million baby eels have arrived in the River Severn this year, conservation organisation Sustainable Eel Group (SEG) said. Andrew Karr, from the SEG, said the Severn was “one of the few remaining places in Europe where there is an abundance” of eels, but he warned eels have been “getting ever more endangered over the last 20 years or so“.